Hyderabad: Dil Mohammed, 71, is not sure if he wants to go back to Myanmar and neither does he want to live in a state of penury. He just wants to have good food and a clean bed to sleep. Emerging out of his plastic tent near Fatima Masjid at Balapur, Dil just wants a refugee status and a settlement. The plight of Rohingya Muslims, nearly 3,000 of them, who started making Hyderabad their temporary home since 2009 is no bed of roses. In each camp as they would like to call their colony, there are close to 60 families living in small plastic tents which are held together with bamboo. With no proper drinking water facilities and lack of sanitation, these migrants are prone to diseases. Though Confederation of Voluntary Organisations (COVA) is helping asylum-seekers and refugees, almost 98 per cent of Rohingya Muslims who are illiterate are finding it difficult to get jobs. With language being a problem, most of the men work as daily-wage labourers at construction sites and in small-time hotels. Rohingya Muslims are spread out in Balapur, Royal Colony, Fatima Masjid, Hafiz Baba Nagar, Hamza Colony, Shaheen Nagar, Jalpally, Shastripuram and Kishanbagh. Md Younus, the only one who speaks English, teaches children on and off. “We want to live with dignity and want the Myanmar Government to give us citizenship or any other country. We have an identity and we no longer want to live like this,” he said. “Aung San Suu Kyi herself spent 15 years under house arrest but now she isn’t willing to give us freedom and our rightful place,” he added. In a recent interview to the US Ambassador Scot Marciel, Suu Kyi suggested to him to not use the term Rohingya. Rohingya Muslims are treated as illegal immigrants from Bangladesh and for this reason, Myanmar denies them citizenship. According to United Nations, 1,20,000 of them have been forced to flee Myanmar in the last few years. From a mere 30 people who landed in 2009, the number has swelled to 3,000. People who are eligible have to go through a four step process before a card is issued. The lack of English and local language skills and illiteracy is making it difficult for the Rohingya Muslims to make two-ends meet and as a result are also falling prey to anti-social elements. Most of them had to take special permission even to visit Yangon and none of the refugees ever seen the place. 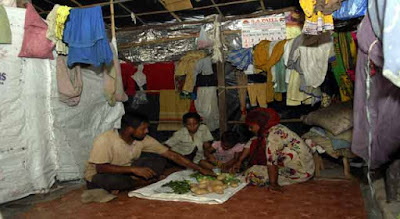 With the government in Myanmar not too keen to receive them, they have been living in penury not only in Hyderabad but in several other states in India. The UNHCR regards that the Rohingya are among the most persecuted minorities in the world but no one seems to embrace the ‘nowhere people’ as of now.